Roux and Hurricane were simple, he was desperate to go as a Werewolf and Hurricane swung between a Princess (roll eyes) and a Princess. She definitely wanted to be a Princess. In the end I managed to talk her into being a Vampire Bride which is at least slightly scary. 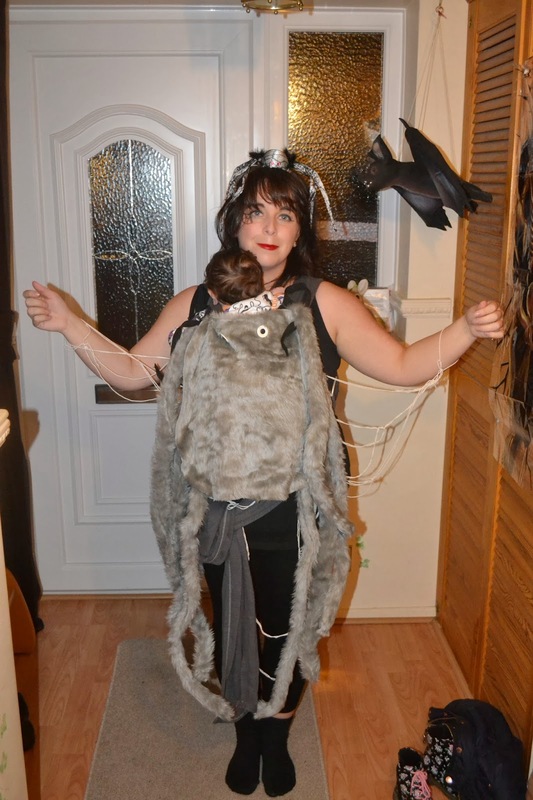 I don’t know if it’s a British thing but when I look at Hallowe’en costumes from over the pond they seem to just be general fancy dress and anything goes but over here, in Britain we like our costumes to frighten so a Princess just would. Not. Do. Those sorted I looked to mine and Elf’s, he’s recently been christened that moniker as he often resembles a very grumpy Elf when he’s not getting his own way. In other words if I’m not feeding him, gazing into his eyes, entertaining him or if I dare to commit the sin of actually putting him down I’m frowned at and quite often cried at. Anyway, due to his dislike of being out of my arms I needed to be able to incorporate him into my outfit and me into his. 99% of the time he’s either worn in a sling/Mai Tei/Close carrier/ring sling or in my arms so whatever I put him in wouldn’t really be seen. I started googling and scanning Pinterest but most of the (frankly amazing) outfits were for back carries, facing out or weren’t scary. We’ve already covered that it had to be a ‘scary’ outfit so dressing as a cute ladybird just wouldn’t do. 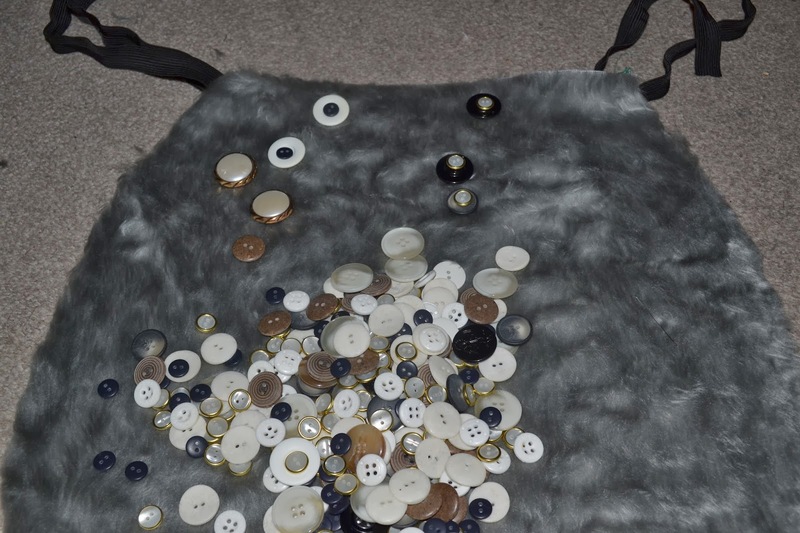 I came across this image from the ergobaby blog a few times but couldn’t find anything about it so I set about making my own. It’s not exactly scary but it’s a spider and they’re vaguely frightening aren’t they? I used to be terrified of them until I had mad moment and stuck a tarantula on my bonce and solved my fear in one foul swoop, sorry, I digress… Unfortunately for me, the internet went down for quite a bit of the night I started making it and I couldn’t get pinterest to load meaning that I had no image to reference to. If I had my time again I’d have done quite a few things differently and when I eventually managed to see the photo (after I’d finished) I realised where I’d made a few mistakes and there is lots I’d do differently but that’s what this blogs for – I’ve made the mistakes for you and I encourage you to make it again correctly. 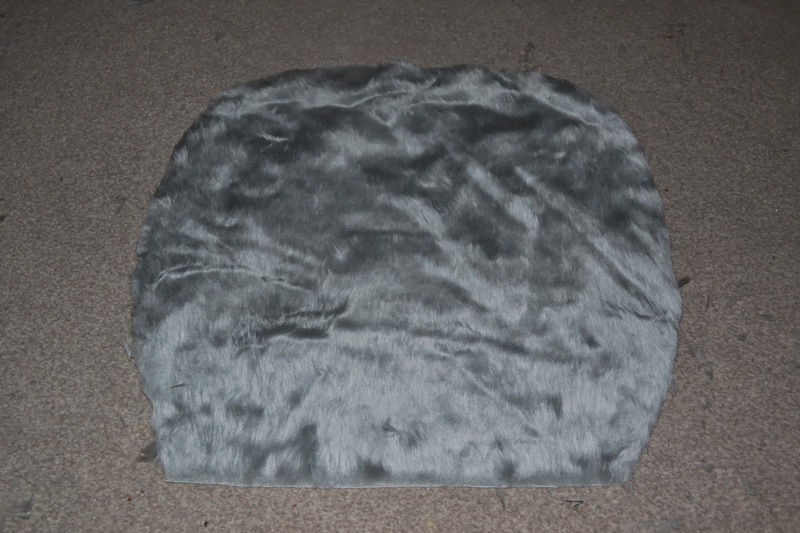 I’d wanted black fur but my carrier is grey so grey would be better. 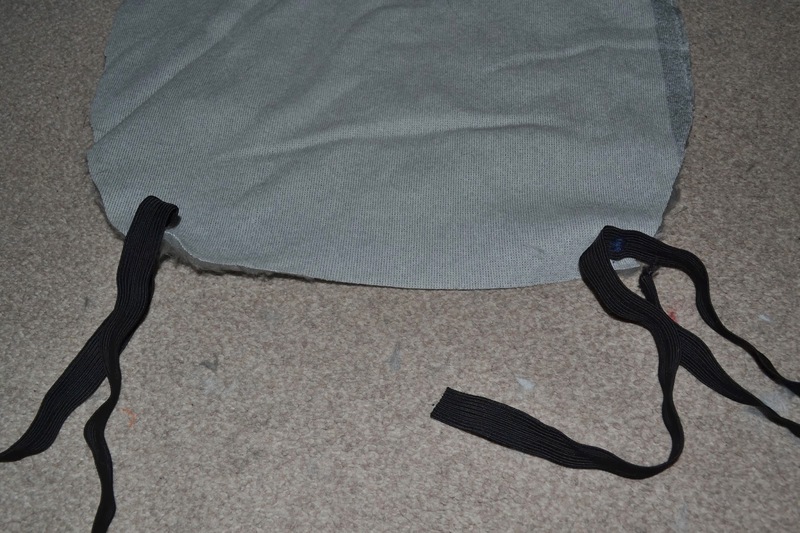 Once you’ve cut out the body, flip it over and sew elastic or ribbon to the two top corners. 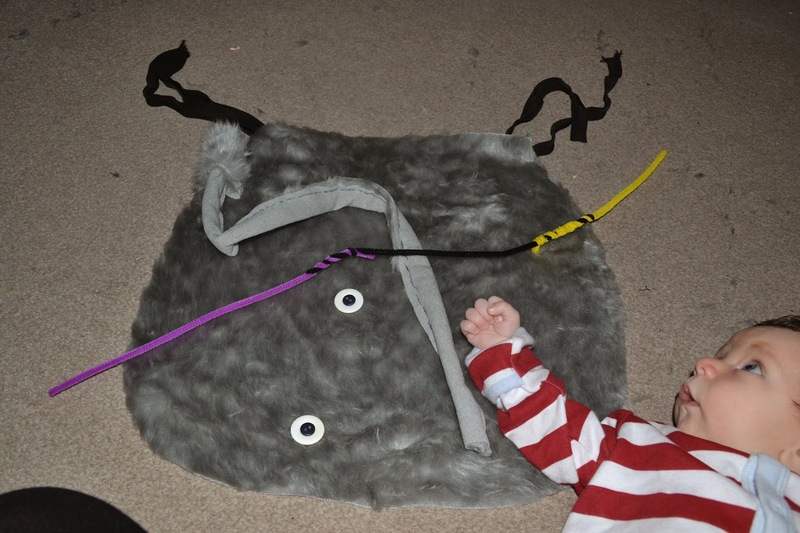 Elf didn’t want me to make this costume and spent most of the evening grizzling so you can see I just grabbed the first cotton reel to hand (blue) and everything is sewn rather messily as a lot of it was one handed while nursing. That’s the main part of the body done, now attention turned to the legs. These took the longest and I’ll admit they are very awkward. 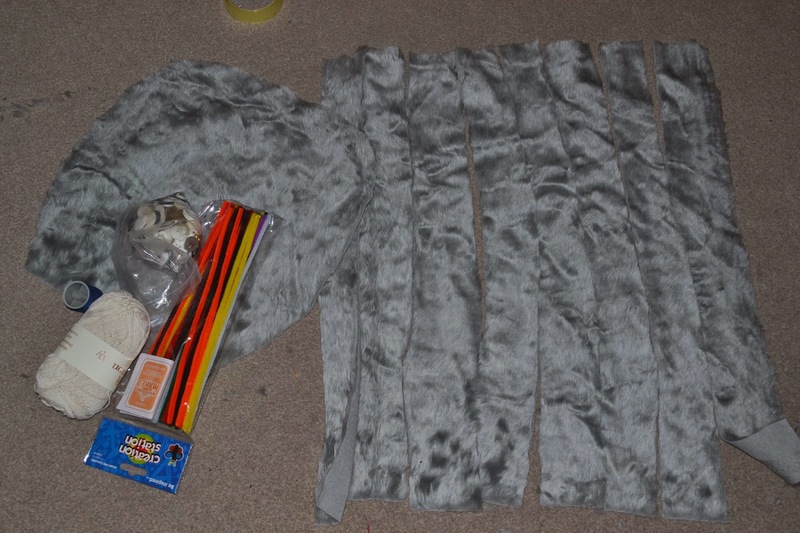 First, you need to sew each of the legs up one side so you create an inside out tube with the fur on the inside. 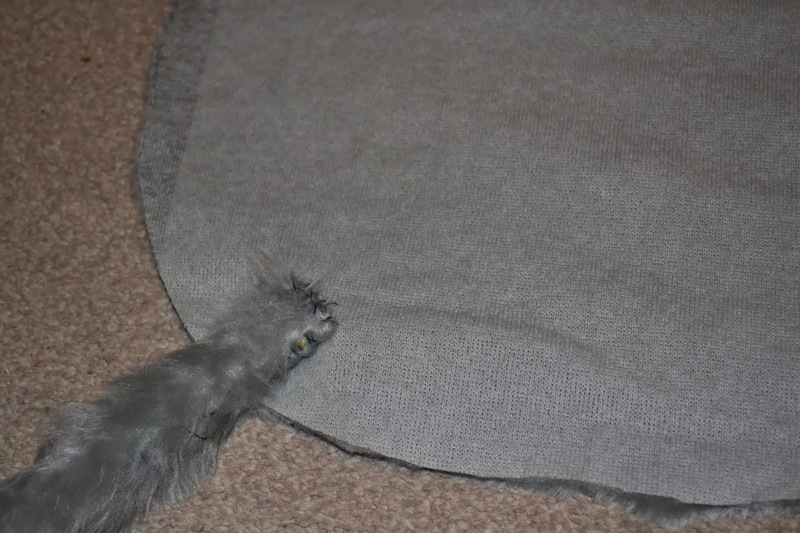 Doing it this way means that the stitches will be hidden. 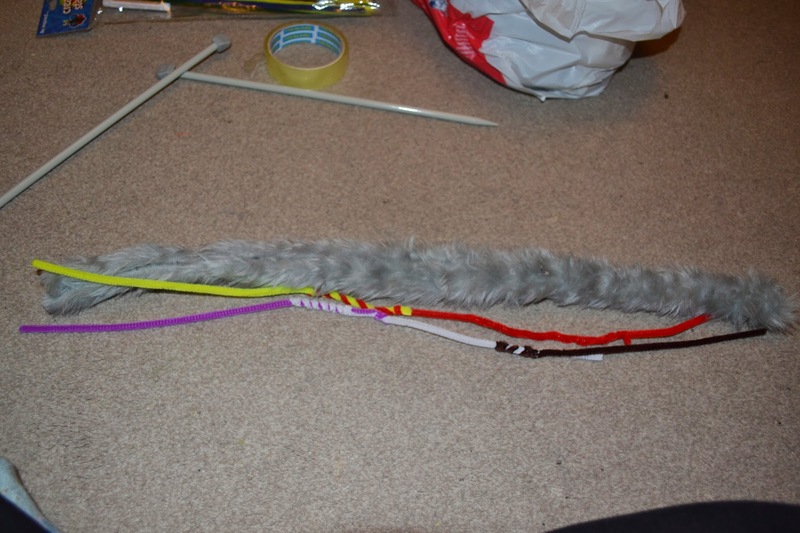 An example of this is photographed below along with the pipe cleaners that I started twisting together to the length of the legs. As you can see, Elf had deigned to lay down at this point but wanted to be a hindrance involved. 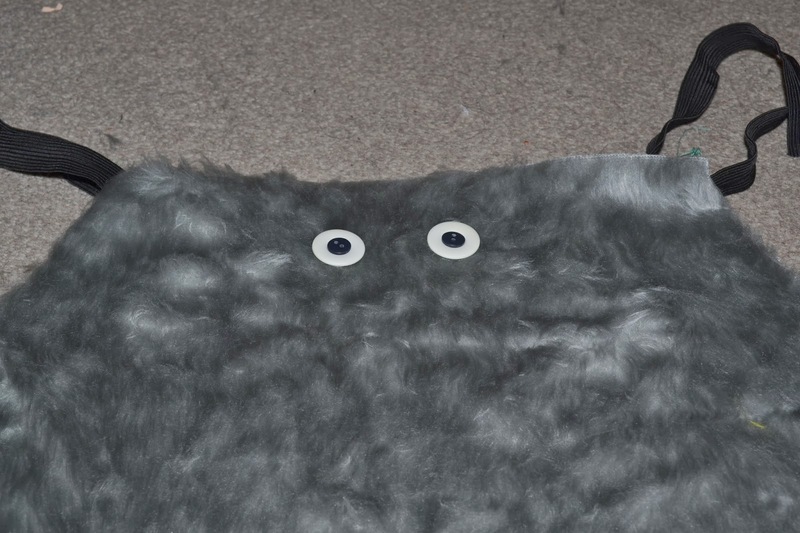 Also evident around the body you can see a proof of the other downside of using faux fur – it’s all over the carpet and got all over my clothing too, there was quite a bit of cleaning up to do. Turning was so difficult/time consuming I didn’t really manage to get any images of me doing it. 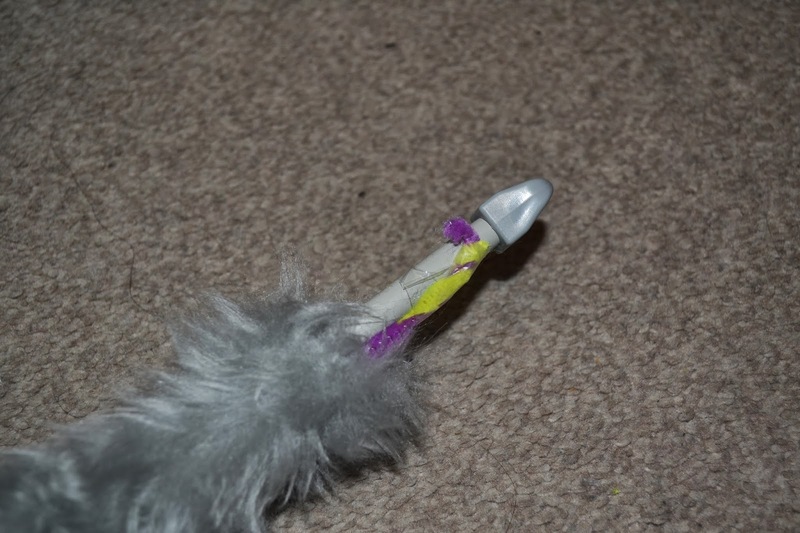 It doesn’t really matter though as it’s pretty self explanatory, start turning it and just feed it through with your fingers, if you get a bit stuck then you might find a knitting needle will help. If you don’t have a knitting needle then a piece of dowelling or something else long, thin and not sharp will suffice. Once you’ve sewn and turned all the legs you’ll need to twist the pipe cleaners to the right length and feed them through the legs. I found that two strands made the legs just right, not too floppy and not too stiff. The only problem is that it’s they catch on the inside as you try and feed them through, I do have a solution though and it’s not pretty but it works. You need that sticky tape that’s in the photo below. 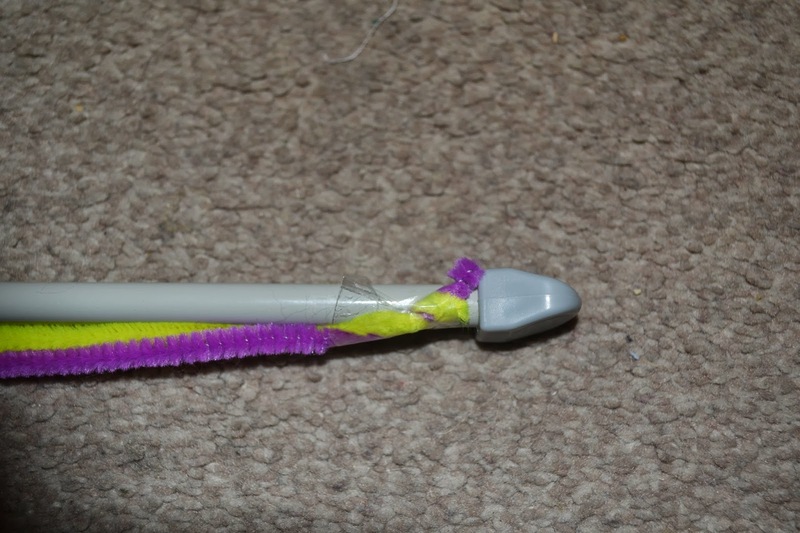 Wrap the ends of the pipe cleaners around the top of the knitting needle/pointy thing and tape it down then just push it through the leg with ease then sew one end (the foot if you will) closed. Evidence of my shabby oh-no-why-do-you-want-constant-nursing-when-i’m-trying-to-craft sewing is clear here. Sew the open end of the legs to the body making sure you don’t go all the way through the body so the stitches don’t show on the front. 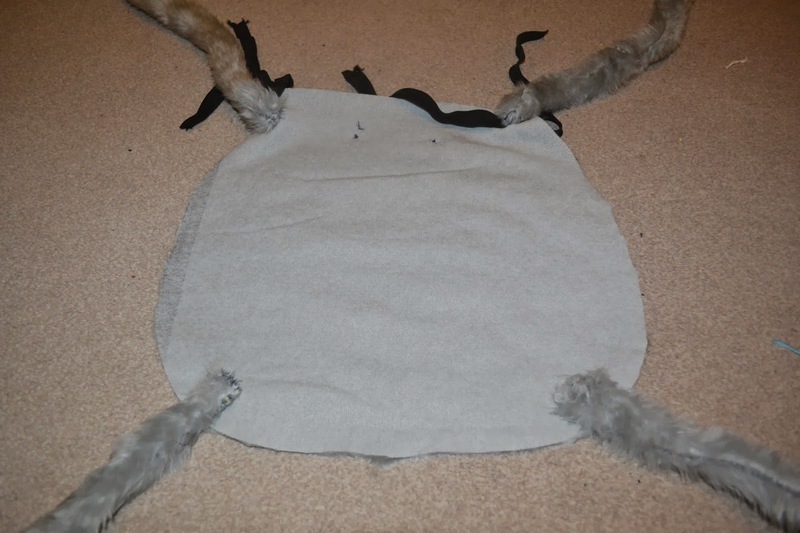 Sew them to all four corners first then sew the remaining legs in between. And the body is done! I’m missing a picture here, it was getting very late so I’ll pop back with one when I get chance to lay it out properly. 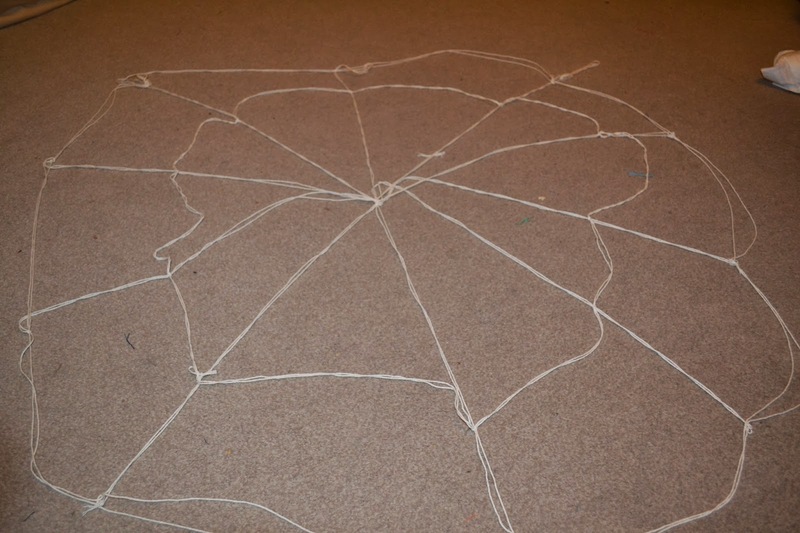 Again, more hindsight notes – use thicker cotton/string than I did here and do more strands to the web. Roughly measure the span of your arms and use that as a guide for the length of the spokes of the web. Here I used two strands of cotton per spoke. 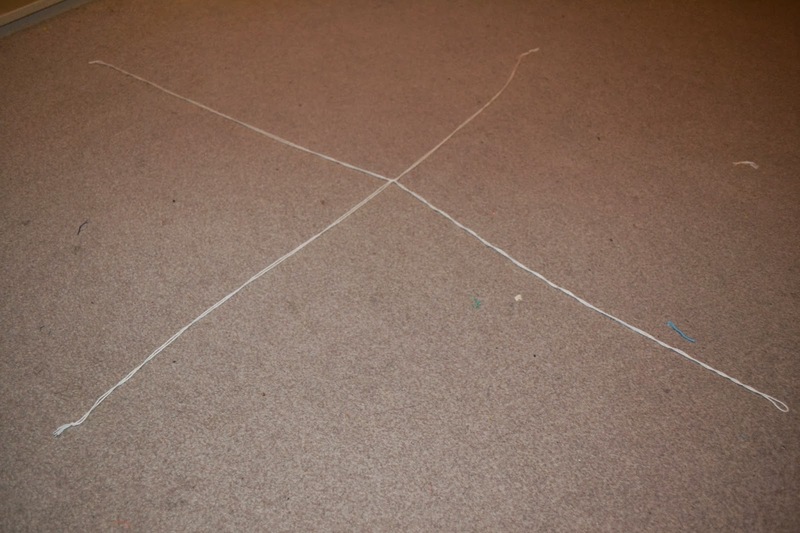 First make a cross and knot them together in the centre then lay more lengths the same size making more spokes always anchoring them with a knot in the middle. 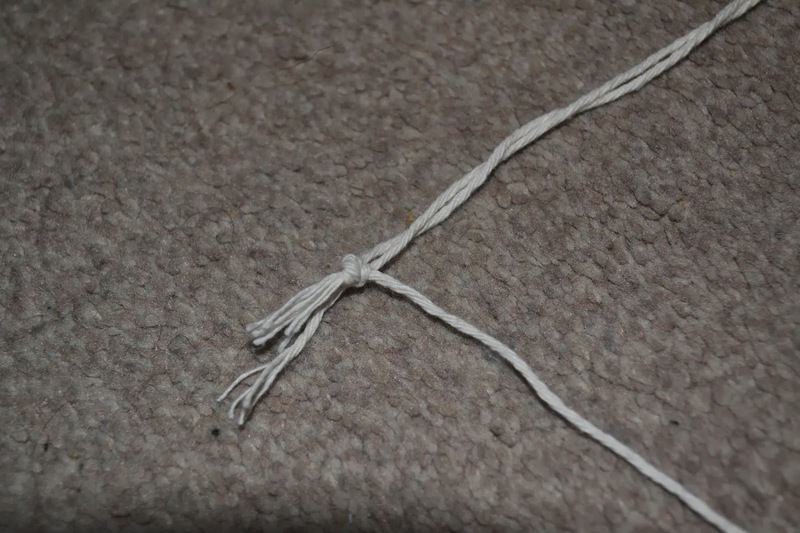 Once you have the number of spokes desired knot a long piece of cotton the top of one spoke as pictured below and keep knotting to the top of every spoke. 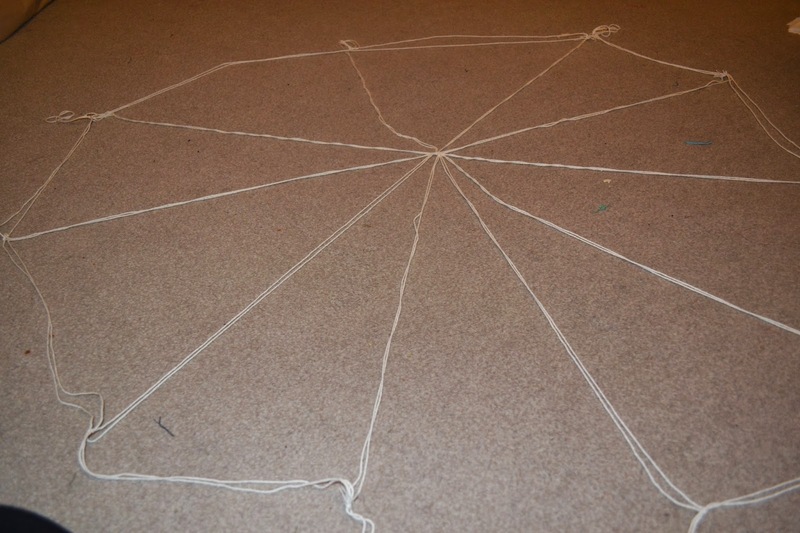 Then start on the inner rings. By this point Elf was very grumpy so I did one ring and gave up, I advise you to do many more. I also attached small wrist loops. And it’s done! I didn’t have a mirror to hand so couldn’t check the positioning before it was taken. I’d just thrown it on in the hallway when we arrived so I need to get a better one quickly. If you’re here from Handmade Monday please say hello.